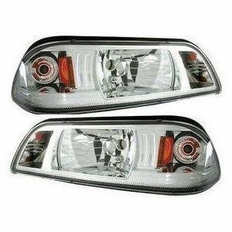 These diamond cut headlights are the perfect solution for your vehicle. Whether you have a dull hazy headlights, a broken one, or you just want to give your vehicle a more custom and prestigious look, these light assemblies are your answer! All IPCE Headlights are sold as pairs and have full compliance with FMVSS-108/DOT/SAE requirements. Simply put, if we would not install those lights on our own personal vehicles, we would never sell them. All in all, IPCW headlights are superbly engineered products that will serve you well. The part number for this item is: CWS-532C2 and it fits 1987-1993 Ford Mustang models.